Employment gains were broad-based across industries, with largest increases in business services, health care, education, construction and manufacturing. Washington: Unemployment in the United States fell to a fresh 17-year low in April amid steady hiring, welcome news for the White House that also could increase the chance of faster interest rate hikes. Employers added a weaker-than-expected 164,000 new positions for the month while the jobless rate fell to 3.9 percent, its lowest level since December 2000. 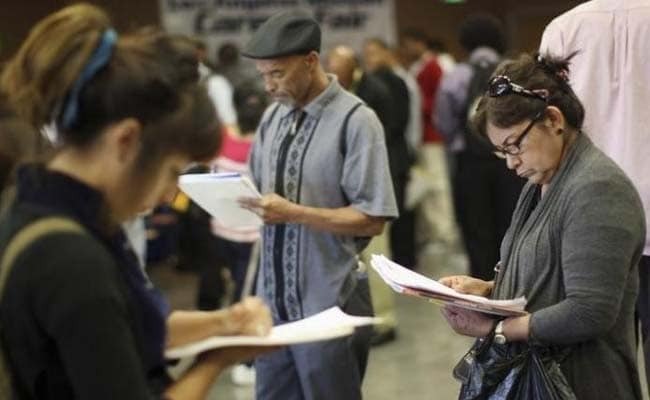 Unemployment among African-Americans fell to 6.6 percent, the lowest since such records began more than 46 years ago. President Donald Trump hailed the drop in unemployment, which had held steady at 4.1 percent for six months, and has taken credit for the robust economy, which has been a bright spot amid an unbroken string of political scandals. "The unemployment rate -- we saw that just today -- just fell beneath four percent for the first time since the beginning of this century," Trump exclaimed triumphantly at a Nataional Rifle Association conference in Texas. Employment gains were broad-based across industries, with largest increases in business services, health care, education, construction and manufacturing. But auto manufacturing, government and wholesale trade all shrank. Economists said the increase, the 91st consecutive monthly gain, was more than enough to keep up with population growth and put average job creation over the prior three months at 208,000, well above the 182,000 recorded in 2017. But after weak hiring in March, April also underperformed, as economists had forecast a gain of 190,000 new jobs. And the labor force participation rate fell to its lowest level since January, accounting for some of the drop in unemployment as people bowed out of the job hunt. So the sudden fall in the jobless rate means the total size of the labor force was not increasing, which is likely to make it harder to find workers and could drive up inflation. Mickey Levy of Berenberg Capital Markets called the jobs report a "mixed bag" but said the unbroken string of hiring was "impressive." "Despite the turbulent financial markets, ongoing global trade uncertainties, and other challenges (rising input prices), firms remain sufficiently confident in the economic outlook to increase both hiring and investment," he said in a client note. Employers nationwide report the pool of available workers is drying up, forcing many to raise wages to attract qualified candidates, which raises concerns about inflation. The April jobs report, however, showed only modest wage pressures, with average hourly earnings up only 0.2 percent for the month, in line with analyst expectations. The unemployment rate last dipped below four percent in 2000 but has not held below that level on a sustained basis since the 1960s, an era that preceded runaway inflation and years of economic pain. The Federal Reserve this week signaled it would not overreact to an uptick in inflation but it could face mounting pressure to act more aggressively in the coming year. "Their forecast for the fourth quarter this year is 3.8 percent, so they have very little room for maneuver," Ian Shepherdson of Pantheon Macroeconomics said in a research note. RDQ Economics said the data was enough to "lock in" a Fed rate hike at the June meeting, and the central bank was now even more likely to raise rates a total of four times in 2018 rather than three -- a prospect that has left markets on edge since February. In response to the numbers, Wall Street did a double take. Stocks opened little changed but then rallied more than one percent with investors appearing to believe the figures in fact lessened the likelihood the Fed will wind up having to raise rates three more times this year.